They were promised a great rehab place, with over-the-top services and plenty of medical staff. One of them is Angel, a short and dark-skinned man. He’s missing most of his top teeth. He said he came to Chicago from Puerto Rico seven years ago for help kicking a heroin addiction. Click here to explore more photos from the story and get a glimpse into the world of addicts traveling from Puerto Rico to Chicago, including their lives on the island. “Somebody told my family is one rehab in Chicago got nurse, got pool, got medication, when I get here I no see nothing,” he said. Angel said that when he landed in Chicago he was met at the airport and taken to a place that definitely had no pool. That place didn’t have social workers or doctors. Instead, it was just a rundown building with other addicts trying to stay clean, sleeping on dirty mattresses on the floor, going cold turkey. Other guys told me something that was hard to believe. They said that it was the police in Puerto Rico who had driven them to the airport and put them on the plane to Chicago. And the one-way plane ticket? Some of the men said if someone didn’t have the resources to travel, their mayor or some other local official would help buy them a ticket. I have been a journalist in this neighborhood for five years and I couldn’t believe this was happening here, right outside my door. I wanted to find more people in this situation. I had seen all these men on the streets before, selling lotions, batteries or socks around 47th Street. It turned out, many of them were also from Puerto Rico. In just a few months, I met 23 Puerto Ricans with similar stories. Has anyone else heard these stories? I needed to figure out who else knew about this. I called homeless organizations, shelters, official drug rehab centers, local aldermen, drug policy experts, but no one had heard about what all these guys were describing to me. Until I talked to Jose Alvarez. He has been working with injection drug users in Chicago for 11 years and he’d heard the same story I had, from users in Humboldt Park. Alvarez is from Puerto Rico too. He is a case manager with the Community Outreach Intervention Projects , an HIV and Hepatitis prevention program at the University of Illinois at Chicago. A few years ago, he was able to get inside one of these residences to do HIV testing. Alvarez knew this was going on, but even he didn’t know how many Puerto Ricans had been sent here. So after our conversation he spent four days going to shooting galleries and shady corners on the West Side. In all those places, he heard the same story I had, from 93 people in four days. “And I’m pretty sure that overall in the city, the numbers are a lot higher, because these are only the people that were in the Humboldt Park area and the majority of them wind up in Back of the Yards and Pilsen, Little Village,” he said. I asked Carlos, one of the first guys I heard the story from, to show me the rehab place where he ended up. Almost all the men I talked to in Back of the Yards went there too. It’s called Segunda Vida, Second Life. 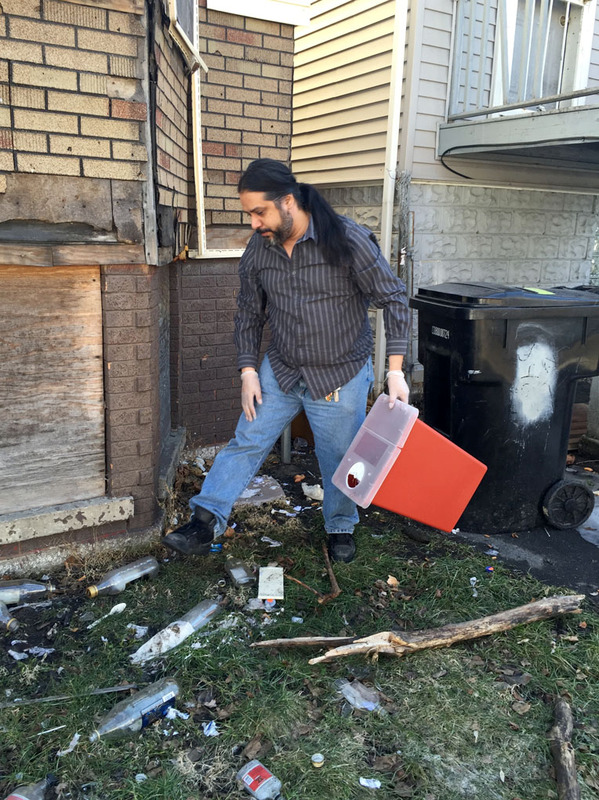 Carlos said it was on 50th Street and Ashland Avenue, but the place is hard to find. It’s almost like hiding in plain sight. Finally, I saw a tiny sign in an upstairs window. It was a version of the AA logo. Segunda Vida is on the second floor of a rundown gray stone building. It sits between a parking lot and a pawnshop. On a busy street. The first time I tried to visit, I went through a narrow doorway and up a steep staircase. At the top was an open room. Men were hanging around, smoking cigarettes. They told me I had to leave. But I went back again and again. Each time I asked to speak to a person in charge. I was repeatedly told to call later or to come back on a different day. But slowly, I did start to piece it together. 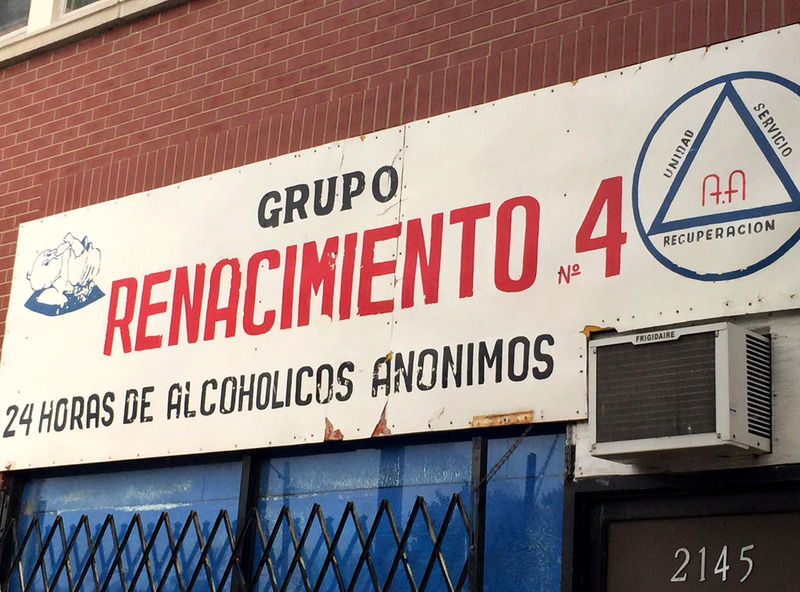 These places are informal drug treatment programs that cater to Spanish speakers. Some Mexican families know about them and send relatives with drug or alcohol problems there. They call themselves 24-hour groups because they’re open around the clock. Addicts sleep there, eat there and they are not supposed to leave for the first three months. Drive along parts of Western or Cermak in Chicago and you’ll see the buildings. Most of them have ‘24 hours’ written in Spanish on their sign, next to an AA logo. I called the headquarters of Alcoholics Anonymous; a representative there said they have nothing to do with these rehab places. She said AA doesn’t offer treatment, transitional living or social services. Its sole purpose is to offer support for people trying to quit drinking. I checked on 14 places to see if they had licenses from the state. But they had none. I went to the city department of planning and development, which gives permits for residential drug treatment centers. They had no records. I requested information from the Chicago Department of Buildings and there were many violations and complaints connected to the addresses where some of the treatment groups are housed. These facilities spring up now and then. They’re run by former addicts and they’re easy to fold up, move and relocate. As I found out more about these groups, I kept finding more people, men and women, on the street with a similar story. Like Manuel, a tall, skinny man who is using a different name to protect his identity. He can only see through one eye and often stares vacantly into space. I asked if he came to Segunda Vida. He said yes, he’d been here for two weeks. He seemed scared. He looked lost, alone and worried about the winter. He told me what a lot of other guys had — the ‘treatment’ there was mostly a lot of yelling and harsh behavior. When Manuel walked out, he left his ID and other documents. He said he tried to get them back, but was turned away. I offered to go with him to Segunda Vida to get his papers. That Saturday afternoon as we walked towards Segunda Vida, my heart was racing. I could tell Manuel was nervous too. Manuel went up the narrow stairway, I followed closely behind. When the people there saw me coming up with a microphone, they blocked us at the top. Manuel asked for his documents. A man told us to leave, that we needed to wait outside. More people came up the stairway, surrounding us. Everyone was tense. A participant from the group kept insisting that we need to wait outside and that I won’t be able to interview or speak with anyone from Segunda Vida. Finally, someone handed Manuel a white envelope with some documents, but they didn’t include his ID. After another tense wait, someone pushed through the crowd and handed over Manuel’s ID. Other people were coming up the stairs. We knew we had to leave. Once we walked out, some of the men followed us out and watched us from the sidewalk. Among the documents were Manuel’s one-way plane ticket and a copy of his medical records, where I found out he is HIV positive. This is crazy. Sick people are being sent thousands of miles from home to unlicensed drug rehab places in Chicago? I decided to go to Puerto Rico for some answers. Puerto Rico is a captivating place. The island is a commonwealth of the United States and known for its natural wonders. On any given night the echoes of salsa music travel across the narrow sidewalks of El Viejo San Juan. But, away from the festive atmosphere lies a darker side. 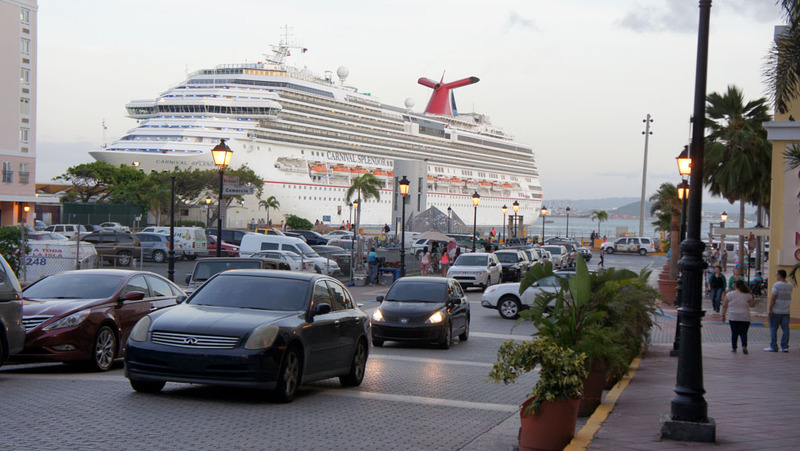 Puerto Rico sits between the Caribbean Sea and the Atlantic Ocean. It’s a key port for the illegal drugs that come from South America to the United States. 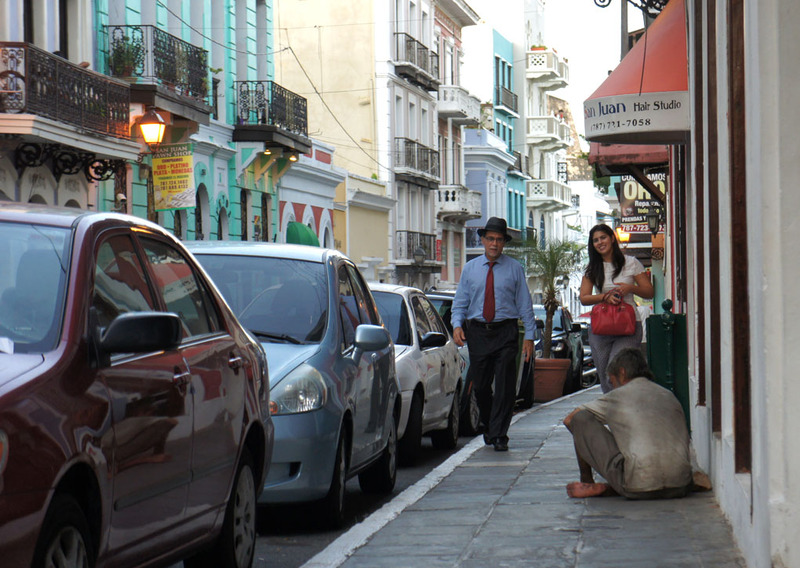 And drug addiction among Puerto Ricans has become one of the island’s greatest struggles. To serve drug users in need of services, community organizations, local agencies and even government officials are coming up with their own strategies. On Monday nights medical students from the University of San Juan reach out to drug addicts living in the streets around the medical district. That’s one of several projects inspired by Iniciativa Comunitaria, a non-profit that offers detox services and drug rehab treatment in the island. The students offer basic first aid to the homeless, including I-V drug users who have developed skin ulcers. Last June, I followed them one night as they made their rounds. Sahily Reyes is a PhD student at the University of Puerto Rico. She is with a group called Recinto pa la Calle, which translates to From Campus to the Streets. Each week the students pack two cars with clothes, food and hygiene products. At one of their stops I met a young man, Louis Reyes Muriel. He was lying on the ground, rubbing baby lotion on his legs almost like he’s getting ready to go to sleep. He said officials from the Puerto Rican town of Bayamon sent him to one of the unlicensed 24-hour groups in Chicago. Several Puerto Ricans I have met in Chicago said they were also sent to Chicago by the same municipality. But I could not verify with the municipality of Bayamon if anyone there helped send users to Chicago. I called and faxed the municipality several times, but no one responded to my requests for more information. Muriel said he left the group and lived in the streets of Chicago, mostly around Humboldt Park. 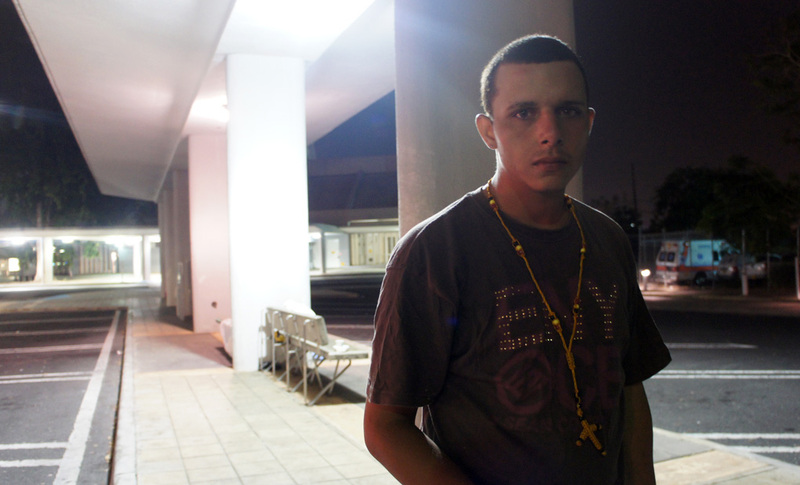 He found his way back to the island and was living in the streets of San Juan when I talked to him. During my time in Puerto Rico, it was clear that no one is hiding the fact that addicts are sometimes sent or referred to the mainland of the United States for services. 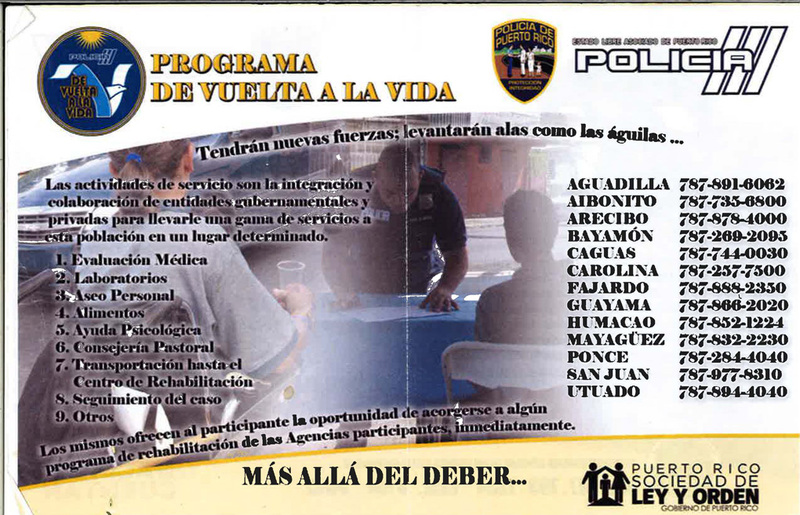 While some municipalities have programs aimed to connect drug users to services, the largest program, called De Vuelta a la Vida or Return to Life is run by the Puerto Rican police, and connects addicts to drug addiction services in and out of the island. I went to a rally in La Perla, a tiny neighborhood north of the old San Juan. That community is known for its ongoing drug enterprise. I run into the governor of Puerto Rico, Alejandro Garcia Padilla and I asked him about the state program De Vuelta a la Vida. I told the governor that some of the addicts that were sent to Chicago are ending up homeless in an unfamiliar city. Padilla then said they should seek additional help in Chicago, that there is help available. 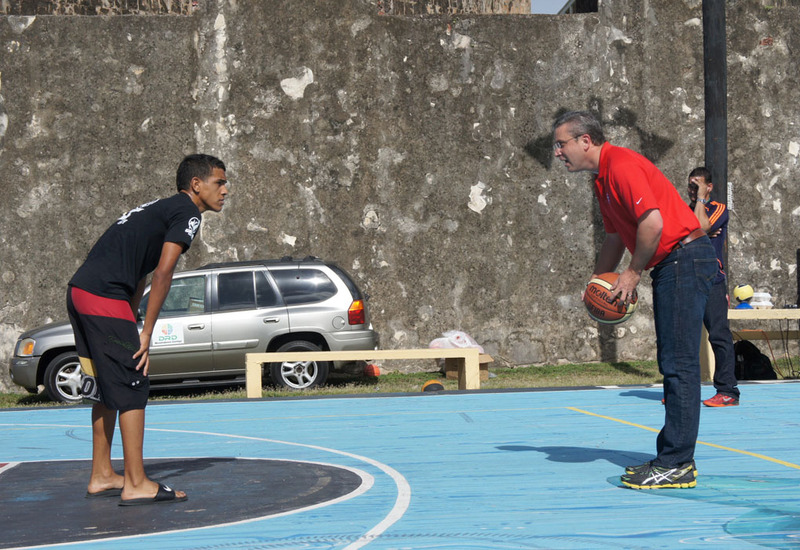 Not only the governor of Puerto Rico was proud of De Vuelta a la Vida. The police were also proud of it. I met with agent Loribi Doval Fernandez. She is the coordinator of De Vuelta a la Vida. She said police officers inform addicts about rehab programs available in other cities and sometimes help send them to the mainland of the U.S.
“We put the participants in our vehicle — a patrol car — we take them to the airport and we do not leave until the plane takes off,” Doval Fernandez said. According to other municipal officials from Caguas and Juncos and even the founder of De Vuelta a la Vida, retired Puerto Rican Police Colonel Benjamin Rodriguez, if families don’t have the money to buy a ticket then sometimes municipal mayors or some other officials will help come up with the money. I asked Doval how many addicts have been sent off the island, including to Chicago? She said she gets reports on those numbers but doesn’t have them handy. Then, I asked. How are the connections with the rehab groups in Chicago and other cities established? Then I asked: Have you checked with government agencies in Illinois or Chicago about those groups? Are they certified? She said the addict’s relatives are responsible for checking out the rehab services. Doval Fernandez said it’s up to the family to make sure the place they’re going to is licensed and effective. And once the person leaves, she said, they’re not Puerto Rico’s responsibility anymore. After my interview with Doval Fernandez, I filed numerous legal requests asking for data on the program. I sent faxes, e-mails, mail, I called, but I didn’t get any answers. Finally, with legal pressure from the Center for Investigative Reporting in Puerto Rico, the police gave me some numbers. In the last decade, the Puerto Rican police say the number of “participants transported to the United States provided by the police areas from year 2005 to 2014” is of 758 people. Of those, 120 came to Chicago. Rafael Torruella is the director of Intercambios Puerto Rico, a needle exchange program for drug users on the island. He wrote his dissertation about drug users who are sent off the island for treatment. I showed him the numbers sent by the state police. He said police have not collected adequate data. ”How many drug users are sent each year, for instance. And who is doing the follow ups? I think the numbers in the documents you sent me seems like a gross underestimate of what’s been happening,” he said. Torruella, who’s also doctor in social psychology with a postdoctoral degree from the National Institute of Drug Abuse, said this is happening far beyond Chicago. Another important question that is not answered by the police in Puerto Rico, he said, is, “Do we know that they are being sent to places that are certified as drug treatment programs or this is just a house that’s -- a fly-by-night -- quote unquote drug treatment services that was built in order to exploit drug users?” Torruella said. I filed formal requests with the municipalities of Juncos, Caguas and Bayamon--three places where users I’d met in Chicago were from. How many people have they sent to Chicago each year? Only Juncos replied with complete information. From 2007 to 2013 that municipality alone sent 259 users outside of Puerto Rico to cities in the United States, and about 56 percent of them came to Chicago. The mayor of Juncos told me his office has offered financial help to those who can’t afford the plane ticket. Caguas officials said they have sent only 25 people to Chicago in the last three years, but did not reply for request of data for previous years. Bayamon’s program, Nuevo Amanecer or New Dawn, didn’t respond to numerous requests for data. And those are only a few of many municipal programs or local agencies that work with the state police or the municipal governments to ship addicts to services off the island. The only Puerto Rican official I talked to who seemed to know the reality of unlicensed rehab places actually left government last year. He was an advisor on addiction affairs for Puerto Rico’s drug addiction and mental health organization, known as ASSMCA. His name is Doctor Angel Gonzalez. He helped put together a press release last year warning people about unlicensed treatment centers off the island. 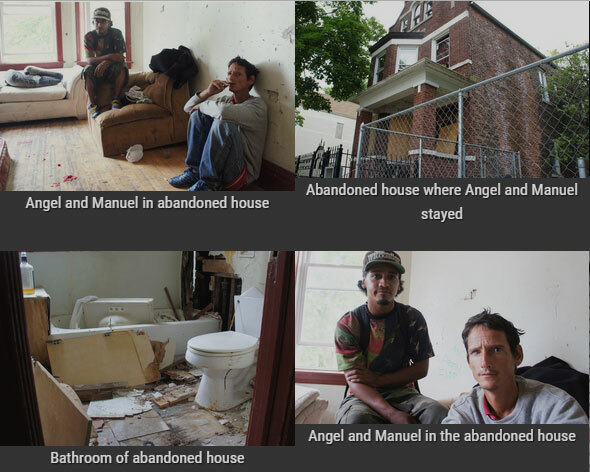 The press release goes on to say that on many occasions, these participants find themselves outside Puerto Rico without a home, without the proper documentation to access other governmental services or without the resources to go back to the island. I asked if he knew of any data saying that it is effective to treat users in Puerto Rico by sending them off the island? Like Gonzalez, other experts I talked to in Puerto Rico said if all the drug addicts on the island were to seek drug addiction services there, only a small percentage would be able to get quality services. Gonzalez said here are only six places on the island where a person can get methadone. He said for a lot of people, the closest place isn’t close at all. So I had found some answers at least. 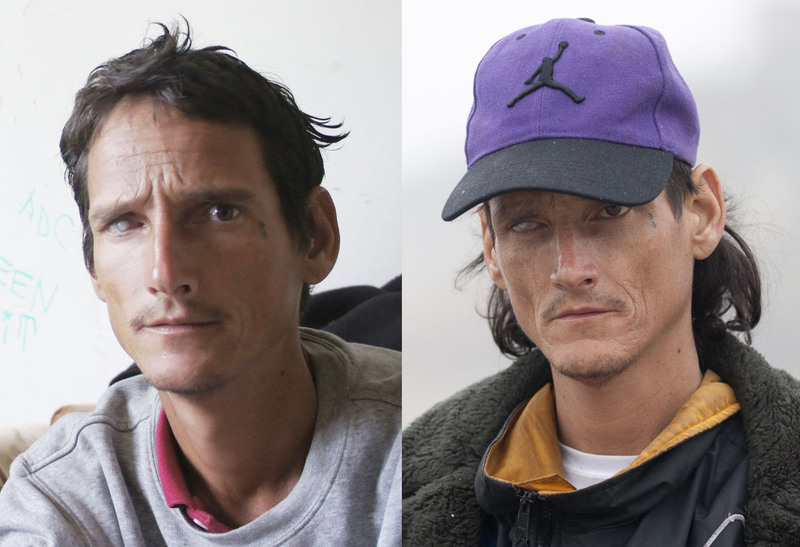 Puerto Rican heroin users are ending up on the streets of Chicago as part of a bad solution to an overwhelming problem happening someplace else. And even though it’s a bad solution, it might not stop anytime soon. Even last December when I was about to leave my office in Back of the Yards, I met a new addict I had not seen before. She was a young woman I met on a freezing night. She was beautiful, from Puerto Rico too. Perfect eyebrows, bright eyes, straight white teeth. Like other users I talked to, she said she was sent by the municipal authorities from Bayamon. She said she had tried at least six 24-hour groups in Chicago since she came. She said after being humiliated in the streets, users like her end up in 24-hour groups only to be yelled at and insulted. It was nothing like what she expected. And Instead of helping her, they have taken her further away from recovery. For more, follow as Adriana&apos;s story continues on This American Life. Adriana Cardona-Maguigad did a lot of her investigation as a fellow with the Social Justice News Nexus, at Northwestern University. She went to Puerto Rico with support from the Fund for Investigative Journalism. Bill Healy and Kari Lydersen and The Center for Investigative Journalism in Puerto Rico helped with reporting. Jesse Dukes produced the audio piece. Chris Hagan produced the digital presentation. Special thanks to Viviana Bonilla Lopez and Wayne Rydberg.